Madison Musicians: Congratulations Ethan, Maxwell and Austin! 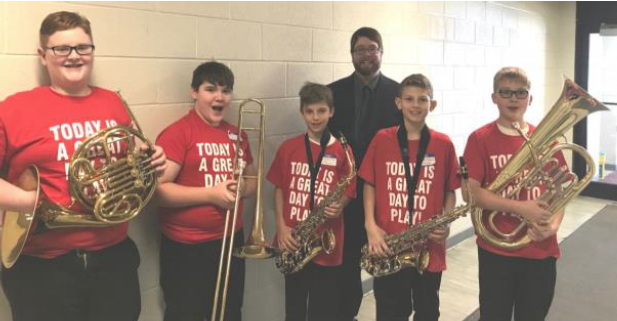 On Saturday, January 12th, five of Massena’s elementary students attended the St. Lawrence County Music Educators’ Association All-County Festival A at the Crane School of Music and participated in the second ever SLCMEA All-County Elementary Band. Those students (pictured above and below) were Ethan Briggs, Trent Howland, Nicholas Gilbert, Maxwell Garrow and Austin Hardy. They joined 54 of their peers from 14 other schools (all of which were hand-chosen by their band directors) to make up this prestigious ensemble comprising of the best 5th and 6th grade instrumentalists from across the county which was guest conducted by Christina Rawady out of Potsdam. Each student received the music for three of the concert tunes back in November and prepared them in addition to their regular lesson materials and band repertoire. The band met for the first time to rehearse collectively on the day of their concert and were so well prepared that they were even able to learn a brand new selection and perform it, all between 9:00 am and their performance at 2:30 pm at Crane’s Hosmer Hall.